The bulk of Trouble in Paradise plays identically to the first Viva Pinata; you’re given a plot of land that you can cultivate any way you want, and depending what’s in your garden certain pinatas will decide to make their home in it. Being a successful gardener means being in tune with the pinata ecosystem, and getting the most exotic and desirable pinatas requires many steps up the food chain. Plant a few carrots to attract a Bunnycomb, and the Bunnycomb will in turn attract a Pretztail who wants to eat it, and so forth. Part of the addiction with Trouble in Paradise is that there’s always something new within your grasp – planting one new seed can attract three new species, which then attract more species, which unlock new abilities, and suddenly it’s 3 AM and you need to get up for work in 4 hours. The 28 new pinata species are easily the biggest draw for fans of the first Viva Pinata. Of course, you won’t get any of the really cool ones (Tigermisu, Polollybear and Choclodocus are some favorites) until you’ve put in some serious gardening time. 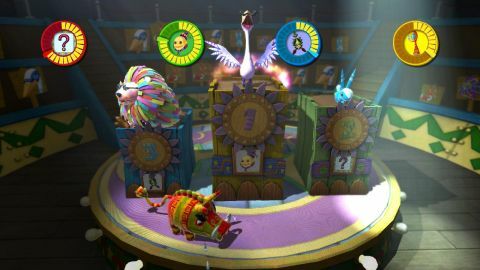 The downside is that the first few hours of the game play out nearly identically to the first – romancing Whirlms and Sparrowmints and planting daisies and buttercups may seem too familiar for Pinata veterans. Arctic and desert regions have been added to spice things up, but don’t really add much other than being a means to acquire new species. You can’t have a garden in these regions; you simply visit, lay traps to attract the pinata you want, and then transfer captured pinatas to your garden. A lot of old pinatas return, and are left unchanged for the most part, except that some have different appear/resident/romance requirements. Domestics from the first game like Cluckles and Kittyfloss now appear in the wild like regular pinatas instead of being purchasable at Paper’s pets. Factory request challenges are also back, but are more structured this time. Instead of requests for pinatas (for example, a kid in China wants a S’morepion for his birthday party), popping up at the most random, inopportune times, you can now fill requests for pinatas at your leisure, and even browse requests to pick and choose which ones you want to do first. As in the original, pinatas are always magically returned in one piece after being sent away to parties. Better not to question it. Description While it may not feel like a true sequel, with 28 new pinata species and lots of tweaks and improvements, Trouble in Paradise is near papery-perfection.